The Do’s and Dont’s For Home Upgrades Before Selling will help you save money and time. When people begin thinking about selling their home in Fort Collins, upgrades can be a first step many people take. However doing too much, or upgrading things that don’t provide much return can be a waste of time and money. They should also be aware that there are cash buying companies who are willing to buy their house in as is condition, just like NoCo House Buyers Inc. But still we have put together our list: of 3 upgrades to invest in and 3 to forget about. A fresh coat of paint can easily brighten up and revive a room. Try to stick with neutral colors and add in pops of color elsewhere, such as throw pillows or artwork. 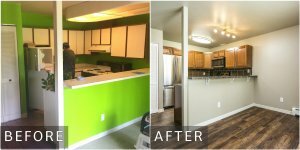 Painting is a relatively low-cost upgrade that can have a big impact. Plus a fresh coat of paint will cover and dings in the wall, nail holes, etc.